The home, it’s constantly evolving in more ways than we can imagine. We’ve gotten to that point where the stuff in science fiction is now a reality, and the lines between the two are often blurred by services and tangible products that help us in our daily lives. Google’s various Assistant-enabled devices, like the Google Home and Google Home Mini, are a perfect example of that and have been well-received by the masses. And if you’ve been satisfied by what these Google Assistant smart speakers have achieved thus far, then your interest may be piqued by what’s in store with the Assistant-powered Lenovo Smart Display. Obviously, this is a product following after the smart displays offered by Amazon, the Echo Show and Echo Spot, which both already have a considerable head start. Then again, the Lenovo Smart Display does show some promise by being deeply integrated into Google’s diverse ecosystem. 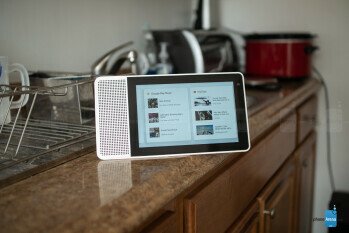 Looking at the Lenovo Smart Display, the 8-inch version in our case here, it looks as though a tablet was merely integrated into a smart speaker – or the other way around depending on how you view it. Regardless, it’s an intriguing design, with the rear jutting out to offer the required support to prop up the smart display, as opposed to offering a more streamlined look. There are physical buttons for volume adjustment and muting the microphone, as well as a handy switch to cover the front-facing camera. 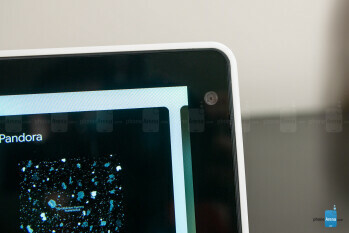 The all-white matte plastic construction does feel solid – complementing the contemporary look of the Lenovo Smart Display. 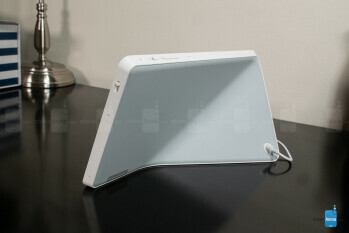 Going with this particular design, it’s better able to adapt and blend into an assortment of décor styles. On one hand, it’s nowhere as discrete-looking as some of Google’s smart speakers, but on the other, it’s vying for attention because of the added level of engagement it possesses. Our only wish, though, was that the display offered some sort of built-in battery, considering how frequently we transported it from one room to another. 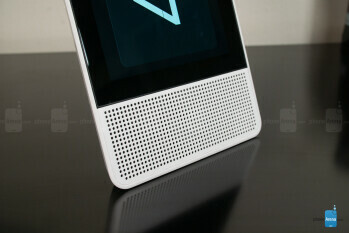 Overall, the design of the Lenovo Smart Display plays it safe. Sure, it could’ve commanded significantly more attention with a more futuristic or industrial design, but we’re pleased that it goes after a more subdued presence amongst the other gadgets and gizmos in our homes. Slapped with an 8-inch 1280 x 800 IPS touchscreen, the Lenovo Smart Display doesn’t dash any records for being the most detailed or pixel-dense. But for its intended purpose, the display here is more than adequate – allowing us to read headlines, view photos, and even watch clips on YouTube. Since the device is stationary and meant to be viewed from distances of around 2 feet in most cases, we have no problems with the 1280 x 800 resolution. However, it can appear a bit washed out, especially with how the color black tends to exhibit a milkier or greyish tone. 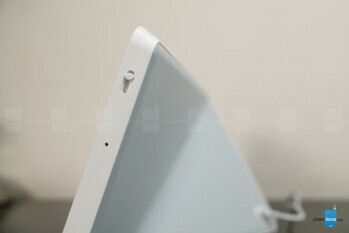 Viewing angles are good, too, allowing us to retain visibility at different angles. 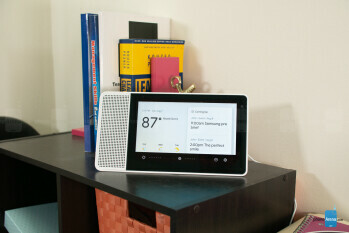 At first glance, most would believe that the Lenovo Smart Display runs full-blown Android, but in fact, it runs Google’s Android Things platform, which is developed with Internet of Things products in mind. 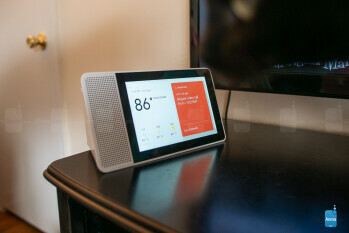 The experience is similar to interacting with one of Google’s smart speakers, as the Lenovo Smart Display is mainly accessed through voice commands interpreted and processed by the Google Assistant. So if you ask it what the weather’s like outside, it’ll respond with a relevant, natural answer. So, what else can you do besides the usual stuff we already know and love about Google smart speakers? For starters, the biggest thing here is the visual element, allowing the Lenovo Smart Display to not only read aloud recipes for a dish, but show us on screen the ingredients and step-by-step instructions. And probably the biggest thing here is being able to watch YouTube directly on it, something that you can’t do on rival smart displays from Amazon. Again, the display here is the biggest differentiator and sets it apart from Google’s smart speakers – so it comes in handy for many things! The homescreen here defaults to showing the time, temperature, weather, and a pane of windows showing some pertinent information – like our calendar events, recommended YouTube clips, and some tips surrounding voice actions. Frankly, it’s not too often that we find ourselves having to interact with the display by touch, since most of the time, everything is initiated through voice actions. Using the Google Home app running on our Android smartphone, it’s incredible how much we can further personalize the experience, like setting up “Routines” where we can say “good morning” and it’ll respond back with the weather conditions, calendar events, reminders, and much more. When it comes to accessing and controlling other smart devices in the home, the Lenovo Smart Display performs exactly like its smart speaker counterparts. Throw in the fact that support has continually grown for Home Control devices, the Lenovo Smart Display caters to a wide range of devices. Want to stream a YouTube clip to your TV in the living room with a Chromecast? You can do that. Want to turn on or off the Philips Hue light bulbs in your living room? Yeah, you can do that as well! Even more impressive, we can even tell the Lenovo Smart Display to choose a particular color with the Philips Hue lights. If there’s one gripe we have with the experience, we have to say that it lacks support for portrait mode – with the exception of using Google Duo for video chatting. That’s the only time when we can choose to go either portrait or landscape, but beyond that, it still puzzles us as to why portrait mode isn’t supported natively with everything. Another would be the current selection of video streaming services accessible to the Lenovo Smart Display. While we relish being able to watch YouTube videos directly on it, there’s no support for others such as Netflix. If you’ve never invested or experienced a smart speaker before, you’ll certainly regard the Lenovo Smart Display as the most advanced and intelligent thing you’ve come across. However, if you’re well versed in what those smart speakers are capable of delivering, you won’t find too many mind-blowing things here. We’ll certainly agree that the display adds a totally new element we haven’t come across before with Google Assistant. Donning a sizable speaker grill, the Lenovo Smart Display does nicely to produce acceptable tunes for music playback. It’s no doubt significantly more pronounced and better than the Google Home Mini. Although, it does not outperform the original Google Home speaker. We'd say its on par with it, more or less. There’s a subtle amount of bass with the output, but at louder volumes, it begins to sound a little bit strained. 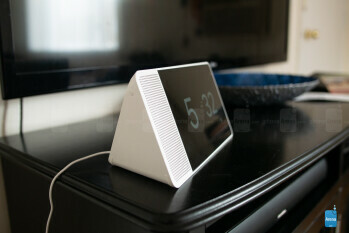 For most settings in the home, the audio quality suffices with its detailed tones. We’d still probably choose to go with the original Google Home speaker as our main choice for music listening. 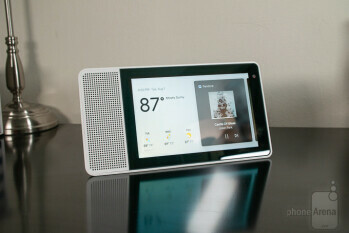 When it comes to initiating the speaker with the usual “Hey Google” voice trigger, the Lenovo Smart Display does a decent job at recognizing and responding when there's nothing being played. Unfortunately, it seems like the microphones have a tough time discerning the voice command when something is playing. In fact, we normally have to speak up a second time for it to register in such instances. 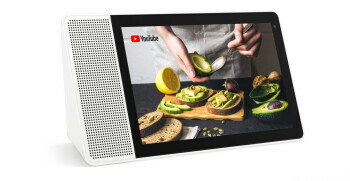 The Lenovo Smart Display ushers in a new dynasty for Google’s Assistant, offering the same rich experience as other smart speakers, but now aided by a useful display for watching YouTube videos, reading recipes, and video chatting courtesy of Google Duo. At the core of it all still continues to be Google Assistant, which has matured with even more functions, intelligent responses, and broader support for controlling other smart connected gadgets. 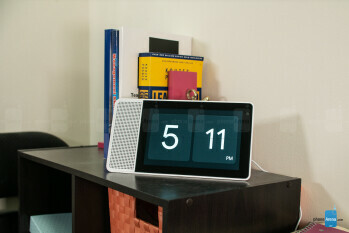 Priced at $200 for the 8-inch model and $250 for the larger 10-inch one, the Lenovo Smart Display does indeed command an investment, but we feel as though it offers much more versatility for the price than the $400 Google Home Max speaker. Compared to the $129 original Google Home speaker, the $70 price separation does manage to validate the Lenovo Smart Display’s worth. Sure, there are still a few things that could enhance the experience to a higher degree to distance what it can do from traditional smart speakers, but it’s only a matter of time before developers truly expose them.